Recommended by leading Dermatologists and Celebrity makeup artists alike, Colorescience is truly blending the line between Colore and Science, and is the evolution into the 21st century of mineral colore skin care. Completely free of the dyes, talcs, fillers, mineral oil, perfumes and other ingredients found in traditional lines, Colorescience gives you beautiful results without disrupting healthy skin function. The line encompasses the essence of colore and the advancements in science to give your skin instant and long-lasting results. 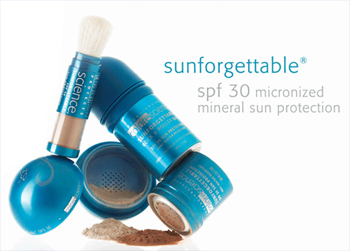 Colorescience products gives patients a completely new way to protect their skin from the sun. A fine mineral-based powder that brushes on to provide SPF 30 water resistant protection with no perfumes dyes or colorants and is ideal for anyone of any age. Colorescience Sunforgettable is available in three shades, Almost Clear, Perfectly Clear and All Clear. Visit www.colorescience.com for product information or to purchase online.